My parents always seemed to have one or more dogs in the household. They included a Greyhound, Cocker Spaniel, Collie, Shetland Sheepdog, English Setters, Irish Setters, and a variety of dogs of mixed and sometimes indeterminate breeding. My own dogs seemed to be of mixed breeds, loosely based on Collie/Border Collie/Setter/etc. parentage. They tended to be medium sized dogs 18-26 inches at the shoulder and in the 30-65 pound weight class. Eventually my work as an I.T. consultant and the frequent travelling that it entailed forced me to remain dog-less for 15+ years. When I married Ann, she brought Jake, a Doberman Pinscher into the household. It was only a matter of time before I found the "right" dog for me. In late 2008, the search began. 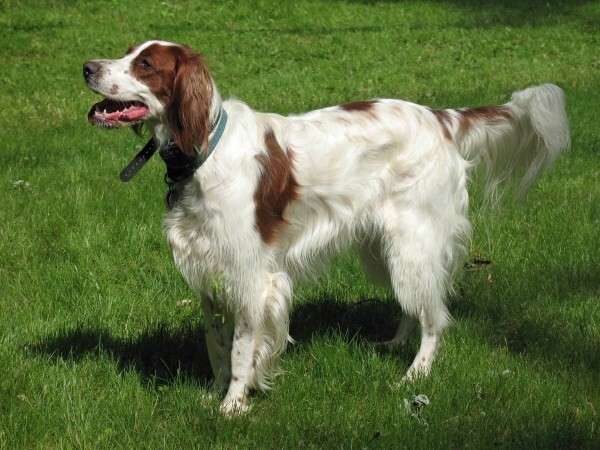 I quickly discovered the new (to me) breed of Irish Red and White Setters (IRWS) and fell in love. The Irish Red and White Setter club of Great Britain describes them as "an ancient breed from Ireland, the forerunner of the Irish Red Setter. They are loyal, trainable (with patience) loveable clowns, and sometimes downright rebellious devils, but with firm and kind handling will become a much loved and admired take anywhere member of your family." After a long search and many inquiries I became very impressed with the dogs and breeding philosophy of Debbie Cournoyer at Moonstone Setters. Her dogs were treated as family members, not kennel residents. They were whelped and raised in a caring home environment, well socialized, and began leash, crate and rudimentary training as soon as they were able. In 2009, I travelled to Moonstone Setters and returned with an IRWS puppy from Debbie's "E" litter. I chose the name Moonstone Eilidh Evenstar for her. Eilidh (pronounced "Ay-Lee") is from the gaelic meaning "sun, radiant one" according to Nameberry.com. Eilidh has more than lived up to her name and breed description. She is the happiest most cheerful dog that I have ever had. When she first arrived home she immediately adopted her crate as her special "safe place." Her house-training was very quick and relatively accident free. She immediately learned her new name and would come when called (usually). After all, she considered that her job was to go and find things (particularly game birds), our job was to find her! With Ann's success training Jake with Loel Turpin (vom Koby Haus Dobermans), we decided that she should be the one to help us train Eilidh. Loel's emphasis on recall being the most important of the early first training steps was most welcome and our IRWS learned very quickly. Having completed the AKC star puppy program successfully, she is now in training for her AKC CGC (Canine Good Citizen) test. She has pretty well mastered the sit, stay, platz (down), and walking with someone whether on or off her leash. However, she is having a difficult time restraining her exuberance when "meeting a friendly stranger" with or without a dog accompanying them. She is a very friendly, lovable, cheerful, and exuberant Irish Red and White Setter puppy. At times she can be opinionated ... and she lets you know what her opinion is (very vocally), but she is my best canine friend and I relish her presence in our household. Clicking on any of the thumbnails below will pop-up the corresponding full size picture.